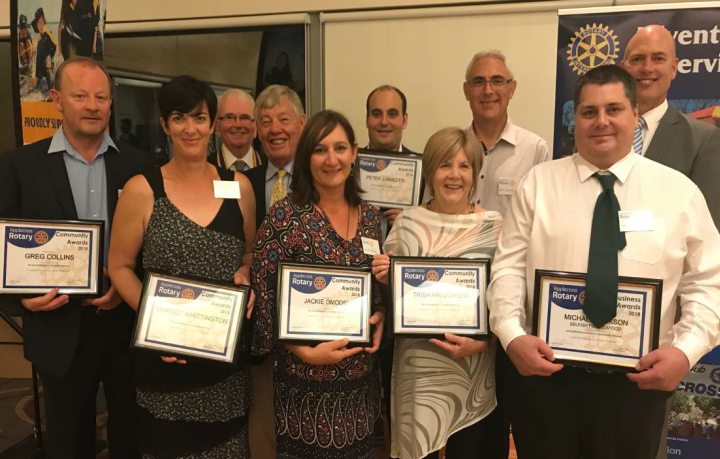 The Annual Applecross Rotary Community and Business Awards evening at Tompkins on Swan on 3 April 2018 recognised seven local residents for their work in our community. Greg Collins, Margot Whittington, Applecross Rotary President Chris Whelan, Committee Chair Gordon Dunbar, Jackie Omedei, Matthew Podesta with Peter Zambotti’s Award, Trish Halvorsen, Bert Giancristofaro, Michael Jackson and the Hon. Dean Nalder. Michael Jackson is an excellent example of a small trader and businessman catering for the local community with fine produce and competitive offerings in a business environment of large-scale supermarket competitors. And he is also a person of generosity towards his local community. If you have been to an Applecross Rotary community event in recent years you probably availed yourself to a bottle of cold water to stay refreshed. It’s cold because Michael, the founder and proprietor of Selfish Fine Seafoods at Riseley Street Shopping Centre, has allowed our Club to take the ice from his ice making system to chill the bottled water on offer. Michael is a generous and a community minded person. He allows many community groups, including Applecross Rotary, to use his ice making system for appropriate community events. Michael has donated all the ice for every Perth Makers Market event, for the Jacaranda Festival over several years, and for those instances where the Club’s BBQ Trailer has been used by community groups. Cruising Butterflies is a day out on a boat for families with children with special needs from the Kalparrin community. It is run by the Cruising Section of the South of Perth Yacht Club, with the administrative support of the Yacht Club. Kalparrin is a not-for-profit organisation that supports family members or carer of a child with a disability or special need. Service providers in the disability sector also use Kalparrin as a trusted information and referral service Several members of Applecross Rotary participate in Cruising Butterflies by making their boats available; all agree that it is quite humbling to experience what many of these families go through every day in raising their special needs children. Bert took the role of Event Co-Ordinator in 2017 and will so again next Sunday. It is recognition that he has taken on this role again this year that he was nominated by Paul Stott a former Captain of the Cruising Section, South of Perth Yacht Club. Applecross Rotary is a sponsor of Cruising Butterflies and is proud to be presenting this award. to Bert for the role he has played and continues to play to the less fortunate members of our society. Greg Collins is President of Ardross Junior Cricket Club. He was nominated by Dushyant Patel, the Club’s Treasurer: “As we know, all junior sports clubs depend on volunteers to serve their members and to ensure things run smoothly. Since I have known him, Greg has served in many different roles at AJCC. With Greg's enormous energy and dedication to the Ardross Junior Cricket Club, it has given our young boys and girls somewhere local to learn the fantastic craft that is cricket. In addition to his duties at AJCC, Greg has somehow found the time and energy to serve as the club's liaison on the committee of the South West Metropolitan Junior Cricket Council and Melville District Cricket. Located within Heathcote Cultural Precinct is the Heathcote Museum & Gallery that hosts regular exhibitions from local artists, a museum detailing the history of the Heathcote site, and a shop full of locally handmade items. Trish Halvorsen is the Program Coordinator for Heathcote Art Tours a program jointly sponsored by Attitudinal Healing WA and the City of Melville. Trish and a group of trained volunteers are available to take small groups of elderly people from the Community, people living with dementia, and their carers, through the Art Gallery during each Exhibition. Trish is a friendly, caring, passionate and highly professional to work with. The tours she runs are always engaging and specific to the exhibitions on display: these change every 6 weeks. This care and attention to detail makes her tours unique. One of her nominators wrote: “We are lucky to have someone like Trish to provide this essential service, making our exhibits accessible to elderly people, those with memory difficulties and the people who care for them. Jackie Omodei has been a member of the Waylen Bay Sea Scout Group for at least the last 7 years. The Waylen Bay Scout Group has been a close associate of Applecross Rotary for many years, certainly for over a decade. Their senior Scouts, Ventures and Rovers have stood with Applecross Rotary at the Jacaranda Festival for many years and we really could not put that show on without their help: the Joeys and Cubs have joined with us on our environmental days planting out sedges and the like to restore the Applecross Foreshore. Jackie is presently the Treasurer and Membership Secretary of the group support committee. Always approachable, never says no and has for many years been the liaison for nearly all members of the Scout group. Jackie is the one who contacts or is contacted by parents of prospective youth who wish to join the group, arranges introductions to the section leaders and handles all the paperwork. Jackie is also the group treasurer, arranging payments, organising bank accounts, arranging audits and completing the endless paperwork that volunteer organisations are required to do these days. All this while working and bringing up three children who have all been or are still in Scouts. Margot is a leader of the Waylen Bay Cub Scout group, a position she has held for six years and loves. She sets out the program with her leaders and makes sure the children from the age of 6 to 10 years enjoy the hands-on experience of being a cub scout. The Cub Scouts motto is ‘Be Prepared’ and she is known as “Magnificent Margo” for the way she helps these young children ‘be prepared’ for adventure and the outdoors through the scouting movement. It is a busy, fun, well run and informative Cub Scout group. Magnificent Margot likes adventure. She has climbed the highest free-standing mountain in the world (Mt Kilimanjaro) with six other friends from Applecross/Melville which raised awareness and $75,000 for the Prostate Cancer Foundation. She has also abseiled down the highest building in Perth- again roping in some Applecross friends, to raise another $4000 for the Prostate Cancer Foundation. Magnificent Margot is also a foundation member of the Applecross Muppets Poker group, opening her house to up to 50 people at a time, for charity poker tournaments to raise funds and awareness to Men’s Health and Prostate Cancer. To date these charity tournaments – out of the lounge room, have raised approximately $23,000. Magnificent Margot has also raised a guide dog puppy for Guide Dogs WA. An intensive 18 months where the $40,000 puppy goes everywhere with her and is trained on the way to being given to someone with sight impairment, is a huge commitment even if the puppy is really, really cute. Peter Zambotti has been a longstanding and loyal team member at Mont Property* since the day the company opened its doors in 2008. He started out as a junior property assistant and has worked his way up to becoming not only a senior sales person at the company but one of the most successful agents within the City of Melville. Peter has been acknowledged several times by the Real Estate Institute of Western Australia for his exceptional performance in real estate sales, however, the real acknowledgement he deserves is for his commitment to giving back to the community. What many don’t know about Peter is of his selfless contribution to the Red Cross and their soup kitchen service. Peter gives up his Sunday evenings to help facilitate the preparation and delivery of food for the homeless and less fortunate in our community. While most of us would be at home enjoying the comforts we are fortunate to have for ourselves, Peter would be out facing the not so glamorous world some people live in. Particularly in winter, this would not be the most desirable thing to do and Peter does it for the genuine benefit of others. He does not seek the kudos for doing so, he just does it because it means something to him and those he assists. Pharmacy 777 and Ross North Developments. 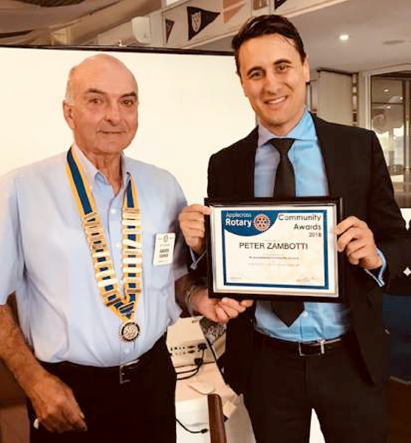 Peter Zanbotti was nominated by Matthew Podesta from Mont Property.